This cold spell even in “Hotlanta” (Atlanta) is bringing me to the soup kitchen and conjuring up flavors from my Irish homeland. There are a few special soups that for me represent Ireland in a bowl and this recipe no doubt is high on my favorites list. Truth be told, I am a huge ‘soup person’, and this one is creamy, flavorful and satisfying with a buttery spring onion puree topped with crunchy garlic & herb butter and Dubliner cheese croutons. Satisfying indeed on a cold night! – The amount of Irish butter in the initial sauté seems rather indulgent but I promise you it creates a magnificent taste and texture. As in previous years, this week I am again heading to Florida with my sponsor (Kerrygold) for a St. Patrick’s day tour of Publix Aprons cooking schools – and I’m so excited to get out there and meet folks, and share what’s great about Ireland! If you live near Sarasota, Tampa, Lakeland, Orlando, Jacksonville, Tallahassee or Atlanta please check out the event page of my website and come and see me. 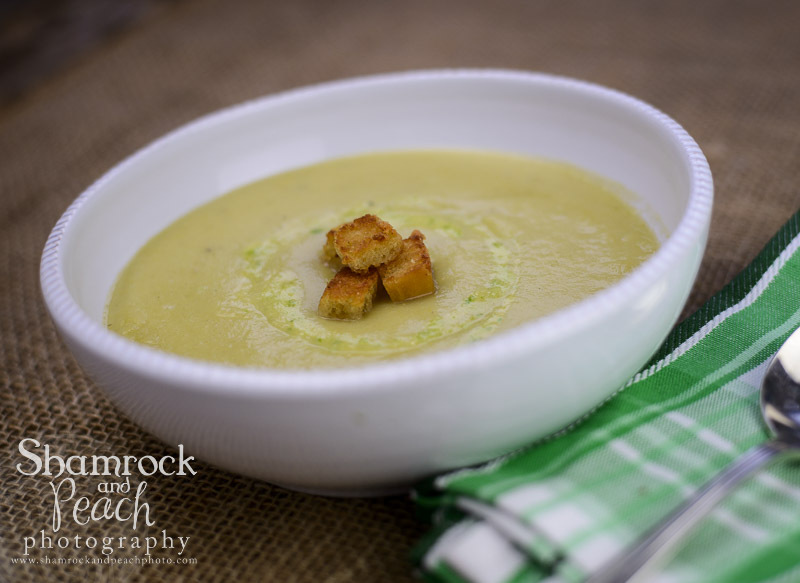 -This soup is one of the yummy features on my very Irish menu just in time for St. Patrick’s day! To make the spring onion purees blanch the spring onions in salted boiling water for just less than 1 minute. Strain and place in Ice water. Transfer to a blender to puree. On low heat melt Kerrygold butter and slowly drizzle in to the puree to create froth. To make the croutons preheat the oven to 325 degrees. Melt the butter and toss in the bread cubes. Bake for 10-15 minutes turning half way or until crunchy and toasted. Sprinkle Dubliner over croutons for 1 more minute to melt.